On Saturday we had the craziest 75 degree day and it was the most amazing thing in the middle of February! 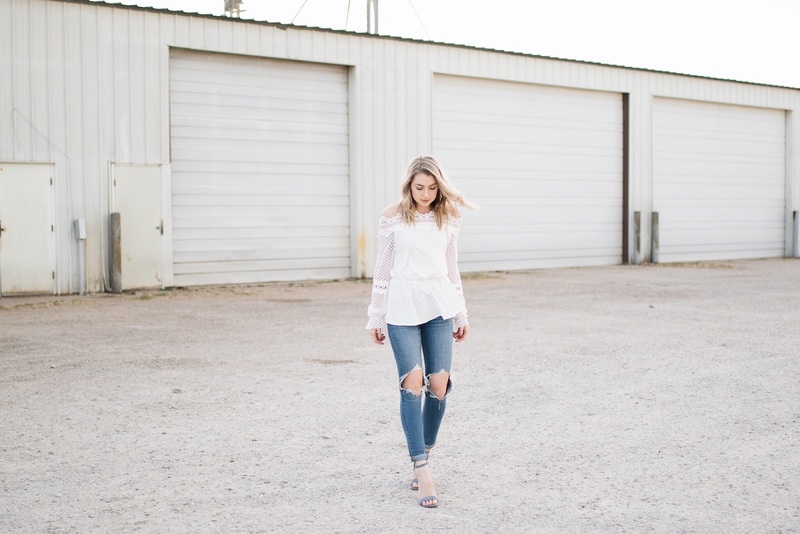 I took the opportunity to shoot this pretty spring top since spring is [hopefully] right around the corner and of course I'm already thinking ahead with outfit ideas and things I want to buy! Since this top is quite feminine, I decided to 'tone it down' with ripped jeans, and loved the juxtaposition of the two. **Edit: When I published this post this morning I totally wasn't thinking about it being Valentine's Day, but Happy VDay girls! Do you have any special plans?? Trey and I are keeping it more low-key this year and just going out tonight for sushi and drinks. I'm so excited for a little date night :) Last year we did a fancy weekend getaway and dressed up and gave each other nice gifts, but with our home reno projects coming up we were both completely content with a date night and the chance to spend some time together!